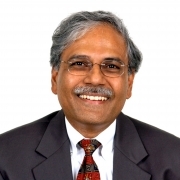 Shekhar Shah is the Director-General of the National Council of Applied Economic Research (NCAER). As the CEO of India’s oldest and largest independent economic think tank, he manages NCAER’s wide-ranging research activities across all sectors of the economy, including its extensive data collection, innovation, and curation activities. Prior to joining NCAER Shah was the World Bank’s Regional Economic Adviser for South Asia and, earlier, Sector Manager in the Bank’s research complex and a principal author of the 2004 World Development Report, Making Services Work for Poor People. During a World Bank career spanning more than two decades, Shah also served as the Bank’s Deputy Research Administrator, Sector Manager for Public Sector Management for Europe and Central Asia, and Lead Economist for Bangladesh. Before joining the Bank he was the Ford Foundation’s Program Officer for Economics and International Relations for South Asia. He worked earlier in Washington DC consulting for the US Federal Reserve Board, FDIC, the OCC, and US banks and bank holding companies. Shah received his BA in Economics from St Stephens College, Delhi University, and his MA and PhD in Economics from Columbia University.